This year’s angel is holding a house. It was designed to celebrate a life that was lost, loved and remembered. Each angel is highlighted with Mother-of-Pearl, kiln fired twice, and individually polished to a fine smooth sheen. They are hand-cast hollow ornaments made of highly translucent porcelain. They glow when a light is placed inside the back of the ornament. They display beautifully on a stand or hanging from a decorative ornament hook. 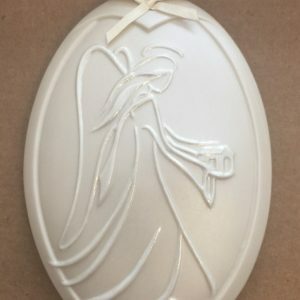 A cream-colored bow and ribbon are hand applied and the angel is packaged in a box.